Compact sedans are a path for those who are looking something between small cars and luxury sedans. 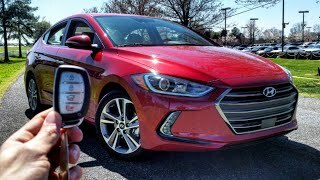 The competitive automotive industry gained another such gift at the 2015 LA Auto Show with the Hyundai Elantra Sedan 2017. Hyundai designed the new release with some really bold features and new engine options to complement them. 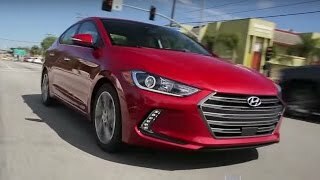 Let us have a look at the review of Hyundai Elantra Sedan 2017 to know in detail about it. The interior of Hyundai Elantra Sedan 2017 gets some new clues and takes a lap ahead of its predecessors. Borrowing some trends from the Sonata, dashboard of model gets many rectangular segments. The latter includes gauge cluster behind the three-spoke multifunction mounted steering wheel and an infotainment screen area. Talking about the instrument cluster, it features a 4.2-inch color TFT display while the latter comes with an eight-inch screen. The seats are made from a soft natural environment friendly material called SoyFoam. The interior isn’t just about looks and luxurious comfort but also about space and tech features. The infotainment system includes Android Auto with next-gen Blue Link telematics system and much more. 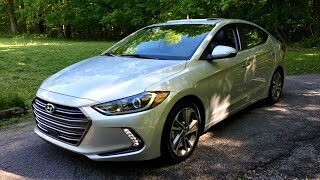 In all the interior details of Hyundai Elantra Sedan 2017 to me looked both luxurious and innovative. The exterior of Hyundai Elantra Sedan 2017 will give you the upscale feeling with the first look. Starting with the front fascia, it has a massive grille flanked by HID headlights and integrated LED daytime running lights on both the sides. Beneath this set up the newly designed bumper gets adorned by the gorgeous LED fog lamps while the hood also gets a new stance with the accent lines running across it. Moving towards the rear end you’ll notice the 17-inch alloy wheels with chrome trim all prepared to roll down the lane. The rear end has LED tail lights giving the perfect glow for your night journeys while the lower portion has newly designed bumper makes the car more attractive. 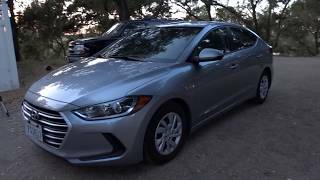 In all the exterior details of Hyundai Elantra Sedan 2017 scream loud the luxurious saga from the house of Hyundai. 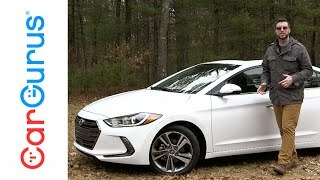 Beneath the hood of Hyundai Elantra Sedan 2017 are two powertrain options; first is 2.0 liter Nu MPI Atkinson four-cylinder engine generating total output of 147 hp and peak torque of 179 nm while the second is a 1.4 liter Kappa turbocharged GDI four-cylinder engine cranking total output of 128 hp and peak torque of 212 nm. The former comes paired to six-speed manual or six-speed automatic transmission while the latter mates to EcoShift seven-speed dual-clutch transmission and offer three driving modes; Eco, Normal and Sport.